In Energy, Oil Supply Limits and the Continuing Financial Crisis, by Gail Tverberg. The fact that these articles have been published is significant, because articles in the mainstream press, such as Bloomberg’s recent article, Peak Oil Scare Fades as Shale Deepwater Wells Gush Crude, seem to suggest that our oil problems are past. While the US oil supply situation may be a little better, the world supply situation is still very bad, and oil prices are still very high around the world. Furthermore, high oil prices tend to have a recessionary effect, and can lead to debt defaults. These issues are described in both the second and third articles above. Thus, there is a substantial chance that high oil prices are contributing to the debt default problem in Europe, and to forecast low world economic growth. In this post, I briefly describe these articles. 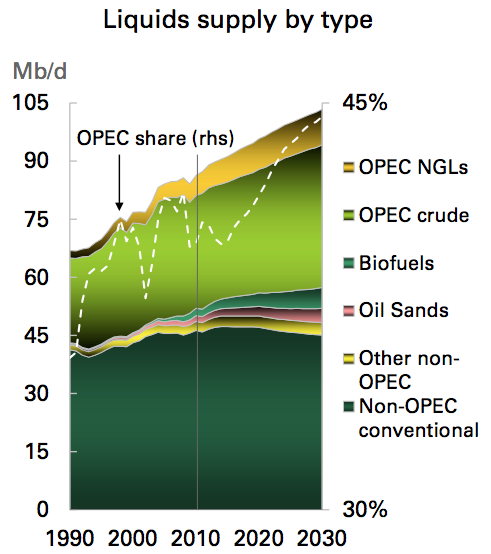 This article points out that even the optimistic estimates, such as BP’s recent Energy Outlook to 2030, see little growth in non-OPEC conventional oil production between now and 2030 (Figure 1). We are thus dependent on growth in OPEC crude oil and in OPEC natural gas liquids, neither of which is assured, given political uncertainties in the Middle East. While technology advances are making possible some new US oil production, this growth is needed to offset declines in existing fields around the world. There is a great temptation by those using new technology to make forecasts using an “overabundance of optimism.” History shows that US oil production has mostly fallen since 1970 (Figure 2). Figure 2. History of US production of crude oil, in figure created by EIA (similar to, but not the same as, figure shown Science article). There is less fossil-fuel production available to us than many people believe. From 2005 onwards, conventional crude-oil production has not risen to match increasing demand. We argue that the oil market has tipped into a new state, similar to a phase transition in physics: production is now ‘inelastic’, unable to respond to rising demand, and this is leading to wild price swings. Other fossil-fuel resources don’t seem capable of making up the difference. The article talks about how high oil prices erode family budgets, and points out that it seems likely that it wasn’t just the ‘credit crunch’ that triggered the 2008 recession. The oil price crunch was also involved. The price of oil is likely to have been a contributor to the euro crisis in southern Europe. This is an article I wrote in early 2011, that wasn’t officially published until January 2012. The article can temporarily be downloaded free, as the fifth item down on this list of articles from the January issue. In this article, I explain why one would expect high oil prices to cause economic disruptions of many types. If consumers are spending more on high-priced oil (and high-priced food, because both costs tend to rise together), they will cut back on discretionary expenditures, such as going out to restaurants and taking vacations and buying new cars. Workers in affected industries will be laid off. There will also be indirect impacts. People who have been laid off from work will tend to default on their loans, as will people who are living paycheck to paycheck and find that the cost of commuting has rising, and the cost of food has also risen. Holders of sub-prime mortgages will be disproportionately represented in the group of those with defaults, since they were among the least qualified loan applicants. High oil prices can also be expect to affect housing prices. In part, this occurs because people who spend more on necessities (commuting and food) are less likely to want to buy a move-up home. As a result, there will be a cut-back in demand for homes, and thus in resale prices. Also, at the time that oil prices rose in the 2004-2006 period, the Federal Reserve raised interest rates in an attempt to try to bring oil prices back down. These higher interest rates also tended to reduce demand for move-up homes. I also show that the timing in the drop in US home values matches with what a person would expect, if it were high oil prices, and actions taken by the Federal Reserve in response to high oil prices, that were really behind the drop in home prices. This entry was posted in Financial Implications, News Related Post, Published Articles and tagged declining home prices, economic growth, financial crisis, great recession, home prices, low economic growth, oil prices, peak oil, recession. Bookmark the permalink. Your comment is offensive to me. In some ways, what actuaries do is not all that different. Insurance companies always want to know if a hurricane hits, where the damage will be. Or they want to know what the expected impact will be on their policies of some event–a communicable disease that is passed around, or hail storms because of global warming. I agree that collapse isn’t a very nice subject, but sometimes if you are trying to figure out how to mitigate a problem, it is helpful to have an idea of which areas are likely to be hardest hit. Your modeling may also help suggest which strategies for mitigation might be helpful. You need to explain why my comment is offensive to you. If a car crash simulation expert explained (in clinical language) how they modelled and tested passenger injury in crashes it might sound like a similarly cold and macarbe intellectual exercise. Yet I am sure you accept that crash simulation work has a purpose and good applications in improving car safety. In the some way, cold intellectual appraisals, like the one I suggest, which treat humans and human phenomena as just another set of natural events, are the first steps in objectively working out the parameters of our global dilemma. You cannot assume, ahead of time, that this coldly intellectual stage of speculation, modelling and appraisal cannot produce any practically useful information which might enable us to ameliorate the suffering in some quarters and reduce the overall magnitude of the disaster. However, we can be certain that blind emotional denial will have zero results. Frankly, your claim to be offended is an example of anti-intellectual, anti-empirical, anti-scientific emotionalism; the exact kind of denial response which leaves us open to even bigger disasters and even more human suffering. I didn’t get the “offensive” thing either – I found your comment to be good “food for thought”. Thanks for taking the time to write it. Part III examines one scenario I think likely of Extreme Fascism which most people will find pretty unpleasant. Not sure I’ll publish Part III here. to protect and defend that land. your land you grow on and the goods stored in the warehouse. distribute out surplus to his Loyal Subjects. precious metals from the buyers, and this money goes into their Basement Safes. creating periodic “shortages”, even if there is plenty of Oil in the ground. developed an overburden of a population with no remunerative work available. necessary to “Give Away” the surplus to these folks or face a Revolution. Except soon as you do start “giving it away”, the Money loses further meaning. the Great Society program through to just recently. the typical wars knocking down Biblical numbers of around 25% of the population. includes Food, but food is only part of the total production of the society. Ethanol production for Carz reather than Corn for Peoples. insufficeint working money to distribute said resource. a system under great stress here on a daily basis. much and send the relative economics into a tailspin. at reasonable EROEI. its a Tightrope that has to be walked very carefully. OFF. There is no maintaining a Core in such a situation, there IS no “core”. they will. I GUARANTEE it. Interesting! I am not sure I followed 100% of it, but I agree that money and the things money buys need to match pretty closely, or prices start to run up (or down). Right now, the government would like to keep money very easy, and this has a tendency to run up the stock market, and perhaps the price of commodities (depending on how much speculation affects real resources). We have been used to ever-rising resources, so all of our models are based on this. If there is a sudden drop in resources, then all bets are off. There is a huge amount of debt to be repaid, and it won’t be repaid. This will cause huge disruption–perhaps political upheavals. You probably have read David Graeber’s The First 5,000 Years of Debt. I will have to admit I haven’t gotten all of the way through it. It sounds as though credit was used very early on, in the systems he describes–but that would make your model more complicated. No, I haven’t read David Graeber’s book, but I will put it on my reading list. I’ve just been investigating credit history like any typical internet junkie does, following links and reading digests of what other people have researched before me. Resource constraints are a problem as a society grows, but generally have not been the main problem, the monetary system gives out before the resources do. This is true in the current situation also. A monetary system past true “hard money” which just accounts for production has many other facets to it which give the money “value”, primarily Interest and Scarcity and Distribution parameters. Many different distribution parameters have been tried in different combinations, but mainly the idea is to tie Money to Work in order to use it to access Labor. Monetary systems fail when the distribution system fails and you can’t value labor against resource availability. Oil and Industrializatoin changed these parameters significantly and led to both overshoot on an incredible scale as well as the devaluation of labor and the enhancement of the finance economy. In any event, so far as I can figure all the connections, you can’t really have any functioning money in a contracting system. The valuations of assets are too unstable. You have to use other means to maintian social stability, which generally seem to involve a kind of triage through the population. Based on biblical narratives, this seems to work with about a 25% triage of the population base; I am just not sure this can work in the conditions we have achieved as a result of the overshoot of a century of accessing the thermodynamic energy of fossil fuels. In a contracting system, the idea of money as a store of value has to disappear. It is hard to see how this can work. People can pretend for a short time that a little inflation is not too big a problem, but if there are fewer and fewer resources/goods over time, at some point people have to figure out that the money they hold will be worth less and less. So I think you are right about the monetary system giving out before the resources. The fact that our economy is self-organized around the system we have now seems to me to be a real problem. It looks to me as if the system will “break,” if there are widespread debt defaults. Theoretically, the system could self-organize around a different set of rules (taxes, ownership rules, etc) and different financial system (with shrinking money availability, perhaps through a monthly value reduction), but it is hard to see how investment would work in such a system. It is also hard to see how we would get from our current system to a new system, quickly. If there were a “safety net” under our current system, or some system that worked in the past that could work again in the future, I would be more sanguine about the situation. But in the end, I find myself with pretty much the same beliefs that you have stated–we are so far into overshoot that the situation looks unfixable. It’s great that the mainstream scientific press is taking seriously some of the “the impossible facts” the alternative research community brought up. There’s still a long list of these critical thresholds in thinking to be crossed, though. Some of the biggest are still seriously holding back both the alternative and mainstream research communities, is what I hope many quietly realize. One that the alternative research community has taken a lead on is the likely necessity of downsizing the economies, as a survival strategy. Simply said, we apparently don’t know how to run economies except on fossil fuels. For understanding that, though, the alternative community is being hampered by one of the big problems the mainstream community has had all along. Data organized into deterministic models doesn’t represent how economies work. The data we encode and use in models is missing all information on how the living parts of economic systems work. So they have no way to anticipate what new group behaviors will develop as new situations develop. The data that can be collected leaves us with remarkably narrow views. It’s an inherent problem with models, partly explaining why our self-interest economic system is now so profoundly acting against its own self-interest, for example. b) stuck representing them as being controlled by our data from the outside. Using mathematical models to predict the economy has already proven itself to be a terrible way to run a planet. The basic problem is that models don’t even really help you discuss the internally animated behaviors of the system. It directly hampers the discussion of “peak-everything”, for example, keeping us from discussing the critical question of how the economies will respond to decreasing rather than ever increasing energy to use. Will the ever rising energy and resource prices we can generally expect shrink or collapse them? I’ve written some on that particular subject, and lots on the general subject. Basically we need to expand our thinking to begin using a “whole system” paradigm for discussing any environmental system problem. Without it, I think our society won’t make any practical headway at all with our environmental crisis. Hi, Gail. Don’t forget our paper, which appeared in Energy Policy late last year. That is a good point! I see that this is a link to the Elsevier site. They are willing to rent the article for 99 cents for 24 hours–no copies. I hadn’t run into that before.